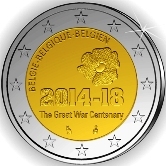 With this coin Belgium remembers the 100th anniversary of the “Great War”- there by is meant World War I. It was also known as the war to end all wars – a designation that sadly proved to be untrue. The motif for the coin is simple and poignant. 2014-18 beneath which is the inscription “The Great War Centenary”. Around the upper left edge of the inner circle the name of the issuing country is shown in Flemish, French and German – BELGIE-BELGIQUE-BELGIEN. At the bottom, around six o’clock, to the left and right are the designer’s mark and the mint mark respectively. And then in the upper right quadrant, a simple poppy is depicted. This poppy, or remembrance poppy, has come to stand for the remembrance of those lost in the wars.